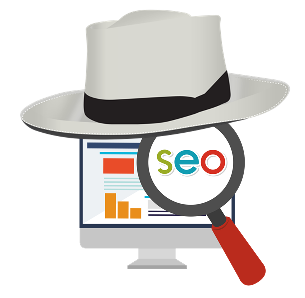 Home > Highlights > White Hat On-Page SEO Practices in 2017 described in simple infographic! Search Engine Algorithms continue to grow smarter; thence using white SEO techniques is the standardized way to stay ahead of the curve. Keyword stuffing, hidden text, unrelated keywords, page swapping, doorway pages, link schemes and rich snippet markup spamming kind of black tactics can penalize you severely. We shall be covering on Black Hat SEO and White Hat Off Page SEO in another article, here our prime focus is on On-Page SEO Updated Practices most used in 2017. This simple to the point ‘infographic’ throws a glance on what we are simmering in details at this occasion. Very first point of attention is that these On-Page SEO practices are applicable for all devices such as desktop, laptop, mobile and tablets. Title Tag Optimization: This is how HTML of a title tag looks like <title>Marketing Orbits</title>. ‘Title’ ascribes the prima-facie of an article on all display platforms like SERP (Search Engine Result Page), Web Browser or Social Media Sharing. It gives an identity to the article just like a name to a noun. A discretely described Title with strategically placed keywords and modifier words packed in definite word length win you the most of battle. Keywords should be chosen as per AdWords recommendations along with clear intent of your article in particular and business as a whole should equally be reflected. Moz.com says that 90% of title display properly if built in range of 50 to 60 characters. Bruce Clay further encircles length of title in 9 words or 70 characters including spaces. Title should neither be too lengthy nor too short and properly categorized in this pattern, “Primary Keyword – Secondary Keyword | Brand Name”. Adding up of modifier words like best, guide, review etc. (as per requirement only) make the title more appealing and compelling. It is the concise summary of a webpage shown by Search Engines in search results under Title and URL, just like in above image. While describing it concretely Bruce Clay goes in more depth and says that it should ideally be of 24 words or 156 characters including spaces. Description is an alternative ‘ad copy’, so should be framed strategically. It should have rich content smeared in call-to-action keywords so that the maximum of a reader’s interest could be availed. Keyword Optimization: Planning, researching, analyzing, selecting and enlisting in meta description HTML tag; the reasonably best words or phrases for your business is all about Keyword Optimization. Another and equally crucial aspect of Keywords Optimization goes with using them in Title Tag, Links (Internal, Inbound, Breadcrumb, Navigational), Meta Description, Page/Article Content, Headings, Images, Alt Text and URLs formation. But it shouldn’t mean a useless overcrowding of keywords, which in language of Black Hat SEO practices is termed as Keyword Stuffing. Also as talked above in Keyword Optimization section, H1 Tag is big strategic opportunity to use natural long-tail keywords (of course with no push or stuffing) so use most prompting words as much as possible in it. 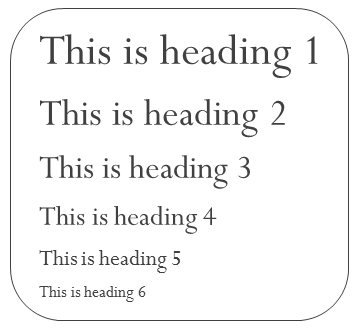 Ideal length of H1 tag should be of 20 to 70 characters. Use H1 to H6 Heading Tags in sequence of decreasing importance! The work which a zipcode written in address of a letter does, similar a URL (Uninform Resource Locator) of a website or webpage does. A zipcode gives information about its territory to the postman, so does a URL to a Search Engine further to fetch or not it against the user query as exact or near to exact match. Leverage SEO Friendly URL Structure & Content: To strengthen the chances of being favourite fetch of a Search Engine, it is imperative to write a sophistic, simple and readable URL. As per Google recommendations a URL should leverage a SEO friendly structure ideally of 3 to 5 words in length. It should contain the prime-most keywords of your business, profession. Title or Heading of your webpage can be the best source of selecting keywords to put in URL. But same time refrain from keywords stuffing in URL as it may blacklist you. Convert complex dynamic URLs to Static URLs! Use Static URLs instead of Dynamic: As the above image elaborates, use static URLs instead of dynamically generated, coded with fussy content or awkwardly long URLs. Use of stop words like a, an, the, but, of, and etc. make unnecessary repulsion for both search engines and readers hence refraining their use is always good decision. Delete duplicate URLs: If there exists two very similar (duplicate) content pages without reason, it shall hamper your content’s overall ranking by distributing it on two. In order to how to come over this problem, Moz presents in their article some technical aspects to be considered for attaining a respectable place for your URL in fetching such as use a 301 redirect or rel=”canonical” to unify duplicates on one URL. Though happening of duplicates by accident won’t penalize you as such but if it becomes habit then Google won’t hesitate to do so. Use Dash or Hyphen instead of Underscore or Space: Search Engines deny use of underscore for words separation in URLs. Now a days use of dashes or hyphens instead of underscores is promoted. So take extra care here. Also try to avoid the spaces (use dash or hyphen for words separation; it is usually done for retaining the individual sense of words) in URL as it gives awkward look by inducing ‘%20’ for each space. So having fewer or minimum sub domains, root directory (ideally one only per website), files and folders make Search Engine to understand your content basket more pleasantly. will be treated as two different pages. So to be with as par quality standards of Search Engines always use lower case letters in URL naming. Make fetching and indexing every newly created URL in Google Webmaster with redirection wherever necessary as a thumb-rule! Let’s take the ‘web hosting services’ as your post office, your ‘website’ as your letter and ‘search engine’ as postman. As much as optimized, secure and fast this whole process would be, so will be your site brand. Along with technical things, Sitewide Optimization deals with psychological reasoning too. If this section is done deservingly it can boost up your site speed less than 4 seconds (as per google recommendations), or 3 seconds (for 100 pages website) as per Tom Dupuis of onlinemediamasters.com . Let’s talk on as such factors one by one. 404 Error Page Implementation: Out of all types of server errors 404 is seen most frequently. 404 error flag tells the user that page is not available or found. Reason behind may be known to you as one of following page under maintenance, server response issue or the page was completely taken offline. 301 Redirect Implementation: It helps to take all kind of fresh or old visitors of your page to modified (in case if you had to do modify it) or new address of your webpage from previous one in search of which your committed visitor had landed. It develops emotional bonding among them for your website. 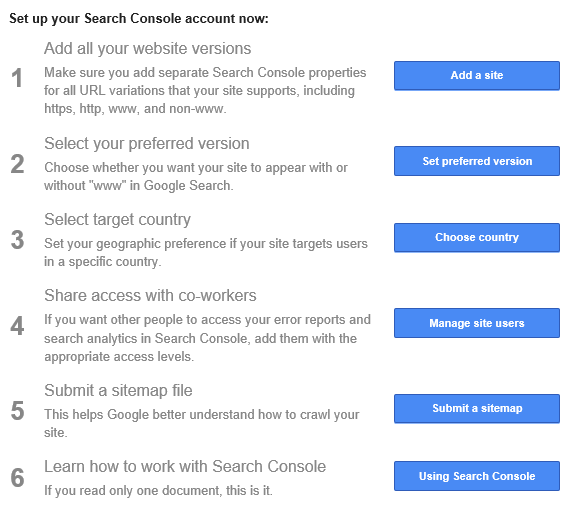 Google Search Console Sitewide Optimization Notification! Add all your website versions you want to verify like www, non-www, http, https (whichever applicable). Next select your preferred demographics if want to set any. Submit your Sitemap & ROR Files so that Search Engine can easily navigate through your site structure to fetch the best available on it. Yoast SEO plugin, XML-Sitemaps.com , Google XML Sitemaps WordPress Plugin and Web Site Map are among best available Open Source Tools available to prepare your sitemap.xml and ror.xml files. ROR.xml carries your page titles and descriptions along with ‘just URLs list by sitemap.xml. ROR file describes your content to servers in more generic way. So it is always better to put both of these files at your root directory. Google Crawl Errors Report: Use Google webmaster tool to know and fix all sorts of Site Errors such as DNS Errors, Server Connectivity Errors, Robots.txt fetching errors and URL Errors of both Desktop and Smartphones utilities. Robots.txt Creation & Submission: The Robots.txt file tells the search engine spiders what to and what not to index. It’s important that this file exists on your root directory of server, even if it’s empty. Also make sure the file doesn’t accidentally exclude important files, directories or the entire site. It helps in protecting your site from hackers. HTTPs & SSL Encryption: Both HTTPs & SSL are among Google site ranking factors now a day. For a secure communication between your website and a browser use of HTTPs encryption is always no fault precaution. SSL is highly recommended for e-Commerce sites for same purpose. Fence your site from Malwares: Since the times WordPress, Joomla and other similar CMSs started trending hugely, they have become the favorite target of spammers. So always check and go by Google Search Console alerts to fix and minimize such threats. Other useful tools and plugins in this regard are Sucuri and iTheme Security Plugin. Site should be responsive on all Devices and Browsers: Either you use pre-defined CMS themes/templates for your website or get it coded independently, for both cases make sure that it is equally compatible with and responsive on all devices such as desktop, laptops, mobile &amp and tablets because Google penalizes unresponsive sites since 2015 and thrashes unfriendly sites last in the SERP. Google Mobile Test is a highly useful tool to check mobile responsiveness of your website. Along with devices equally make sure that your website is compatible with all browsers like Chrome, Edge, Firefox, Safari etc. Use CND & Image Compressing: To achieve the Google’s set 4 second standard as site load time, use CDN, compress images and fast hosting facilities to achieve maximum of it. As per Wikipedia Content Delivery Network or Content Distribution Network(CDN) is a geographically distributed network of proxy servers and their data centers. The goal is to distribute service spatially relative to end-users to provide high availability and high performance. Use HTML Sitemap on your site: Whereas sitemap.xml and ror.xml communicate about your site with server, a beautifully crafted HTML Sitemap page on your site takes technically least knowledgeable users to make familiarity with major blocks of your site in one screen. Tabulated Menu Navigations: helps users to engage with your site more deeply and confidently. So set all sorts of navigations such as Main Menu, Top Menu, Breadcrumbs and Footer very well tabulated, neat and clean. Clear & Separate Text Navigation Blocks: It deals with the layout of your main content visible to user in forms of articles, blogs, posts etc. Very next section after this section deals with it in depth. Size and Quality of Content: decide on how much deeper a reader may dive into your article and how longer he/she may dwell on it. An article with clear message motivates a reader to read till end. The amount of words you have in an article should be balanced. Depending on topic, keyword, competition and user intent (Informational, Navigational, Transactional & Address) it can vary from 300 words to up to 3000 or even more. According to Yoast.com, minimum 300 words to 900 words can be taken as a standard word count window preferred by Search Engines. Backlinko says that longer content tends to rank significantly higher on google first page. Synonyms of your keywords or LSI keywords – Viable use of LSI words and synonyms of your keywords boost your quality. Read about LSI keywords in next to next section below. Topics, paragraphs ordened in above said manner gives a systematic presentation feel, consequently generates an impression of you being disciplined in mind of your reader. What volume of Keywords to position where in your article: As signaled just above about the strategic use of synonyms of your keywords not only add qualitative value to your article but brings variety of words in it and side by side limit the boring repetition of same few words. But same time volume of keywords should fall in a ratio of 1 to 2% to total number of words in your article. Google uses the LSI (Latent Semantic Indexing) mapping to determine a page’s relevancy, thus sprinkle your page with as much as LSI words possible. LSI keywords are the words seen in user search patterns and behavior, and how one keyword is usually linked to another keyword is how LSI keywords are decided. LSIGraph.com is a recommended source of LSI Keywords Generator. AdWords Ads are another very strong source of keywords collection. Google your probable keywords and scan ads appearing alongside SERPs to choose stronger and affirmed keywords. As per recent recommendations of search engines try to include most of your keywords in first 100 to 150 words of your article. Prefer single scrolling instead of using back and forward buttons: I face this problem with more than 50% of sites. Perhaps, they use back and forward buttons to avoid lengthy scrolling down, to get more clicks in traffic recording, to display more new ads with each back and forward click or to show search engines that theirs are the very busy sites. But at their readers end it proves nothing more than an headache for most of time, because users usually don’t want such interruptions more especially if your article catches their interest. Also by now you may have read above that search engines recommend long article under single scrolling, so rest I leave up to you to decide. Dazzle your article with multimedia: Engaging images, videos, infographics (just like used in this article) and diagrams can reduce bounce rate and increase dwelling time on article thus site. Optimized images with target keywords inserted in it ‘Alt Text attribute’ brings higher engagement on your article. Create unique and original content and avoid cut-copy-paste: Do a search to see if your content exists elsewhere on the World Wide Web and if yes then up to what extent. CopyScape.com is a highly used online tool to help you in maintaining originality of your content. Inbound Links – Links pointing to your article (website or webpage) page from other websites earn you quality votes for your website and business. Their use and beautification is not as such in your hands, but earning such links is the most crucial; that is where most of Off Page SEO comes in picture. Outbound Links – Also called as external links, are the links which point to other articles (website or webpage) from your website. These links are a great mechanism to show Google that your page is a hub of quality info. Pages with outbound links outrank pages without outbound links. While adding these links add only relevant to your subject links, use “no follow” attribute wherever necessary, no link should be a broken link and don’t add links of bad sites. Internal Links – Links from one page/post on your website to another page/post on your website. It improves user experience & get more search engine crawls. Let’s talk one more but crucial aspect of Links. There is lot of discussions happen on should inserted links (URL) be given HTML target attribute as “_blank” or “_parent”? A link added with target=”_blank” means it shall open in new tab after clicking and given a target=”_parent” shall open in same tab. Benefit of blank target is that your parent (article) page is still there, you just read the clicked (target) page in new tab, close it and you are back to your parent page; you don’t need to click on back button to return parent page just like in case of target=”_parent”. A further in detail research on this topic would be published in my upcoming articles. Social Sharing Buttons work like magnet: BrightEdge says that using Social Sharing Buttons can increase your social sharing up to 700%. They work like magent in flooding your page with traffic. Show quality comments received from readers to public: Whenever you get quality comments from readers, make sure that they are published for sure. Because such comments are cound as your grades. 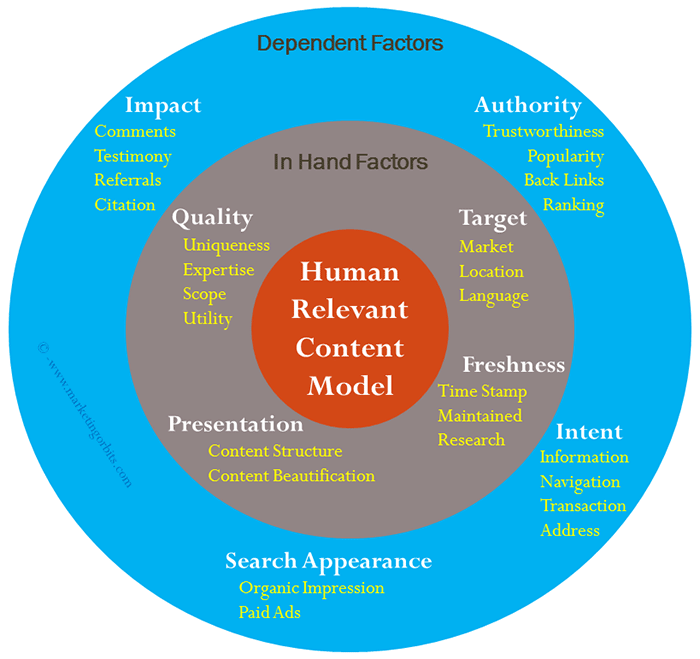 Human Relevance Content Model: There are two types of factors which govern reach and impact of your content i.e. In Hand Factors and Dependent Factors. As the name in itself is self-explanatory, ‘In Hand Factors’ are the writer’s psychological creativity and ‘Dependent Factors’ are the factors which decide your content’s public acceptance. Expertise: Write it like a story telling by including your knowledge & experience on subject, it provides the niche required for your article. Scope: Author should ask to self that does the article touches the maximum possible breadth and depth of at least one of four intents (talked above). Utility: Think before writing that what kind of audience will be reading or using your content and how narrowly or broadly they will be satisfied by it. So is the unique content people likes the most to read. Simply go by it! Freshness: Unmaintained/abandoned ‘old’ websites/articles or unmaintained and inaccurate/misleading content is a reason for a low E-A-T (expertise, authority and trust) rating by Google. Consistent, continued and concentrated R&D around your topic, updating this R&D in your content regularly with a clear time-stamp of ‘Last Updated’ all together provides extra edge. Content Presentation: Please refer to Content Structure section above. A well-structured and beautified content wins the hearts of your readers for you. Target: It is about reaching the right audience of your taste. Knowing your targeted market, language and location creates influence in your writing. Intent: As per my experience and feel gut, there are majorly four user intents i.e. navigating through a content, website, or blog; looking for a particular set of information; doing all sorts online money transactions and finding a geographic address online. Try that your article address at least one of these intents as major though it may satisfy more than one intent too; all depending upon scenario and topic. Authority: It is pertained to popularity and trustworthiness of your website, which comes with time and disciplinary efforts. So you need a discrete pro-active approach and thinking. As a start-up, focusing on earning as much as possible quality backlinks can be the best policy of generating your authority. Impact: It is measured by the number of citations, comments, referrals and testimony your article got from readers. So be active in monitoring and managing these factors after your article is published. As important could this article be till this point, so is the reading of this short but very crucial paragraph. Keyword stuffing, invisible text, doorway pages (entry-pages), adding unrelated keywords to the page content, page swapping (changing the webpage entirely after it has been ranked by search engine), and use of spam tactics can wash out all your hard work done on pattern elaborated above. Google Webmaster Guidelines and Bing Webmaster Guidelines are the best sources to know of all such practices which a sincere and serious blogger should always stay away from. If ever in doubt you can refer to SEO Guide of Google anytime. Simple as that! Focus on your keywords first, topic can be anything but without keywords your article is an orphan. If you are able to figure out 5-10-20 keywords, your job of deciding theme of your article is almost done. Then comes the content generation around these keywords and putting the generated content in order; with it around 80% of you work is achieved. Now remains the task of publishing it online, its URL design, meta tagging, setting the target audience and then indexing it with search engines; talking in details on these aspects was what the aim of this article. I hope you would have enjoyed it! Though article became bit lengthy but in zeal of putting all possible of white hat SEO 2017 (updated) at one place is what I can assure you is achieved. Though there may be many more factors left yet, but I promise you to cover all those in my next version of this topic, that may be coming in mid of 2018; would that be ok for you? And yes please, now it is your turn to assess my work. So use the comment box below and let me know your views. I shall include all valuable points emerging as a feedback and recommendation from your views in next write-up! Cheers! Thank you so much mam! From your intent of say it seems that its non technical aspects grabbed your attention! If I am not wrong the content structure aspects and Human Relevance Content Model? Phool ji… You are unlimited possessions. Superb article. 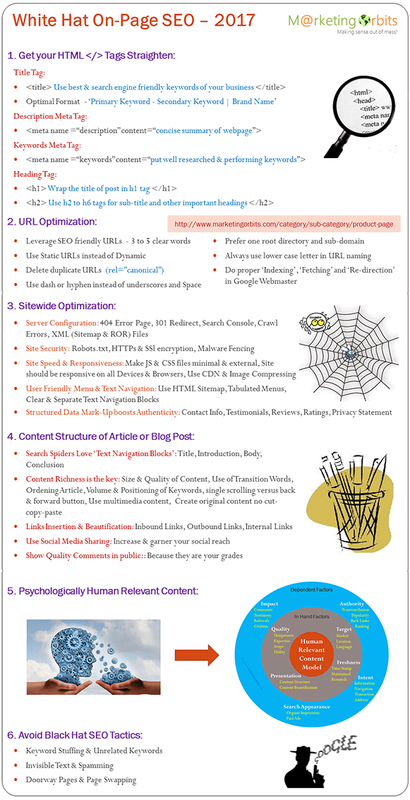 Complete seo and website descipline simplified. Surely the website will shout a loud if the above principal’s are applied. Great information dear Phool Malik. Thanks Dr. Dinesh for your analytical review! I shall try to prevail the same quality and expectations fulfillment in upcoming articles too! Thank you so much SEO Services! Very informative article Phool. In present scenario of Digital Marketting, white hat is the way to go up and stay there for longer term. Thank you. Thank you so much Redbushtechnologies! site as an example, very clean and fantastic user pleasant design. It is very easy. Are you using wordpress or any other platform?